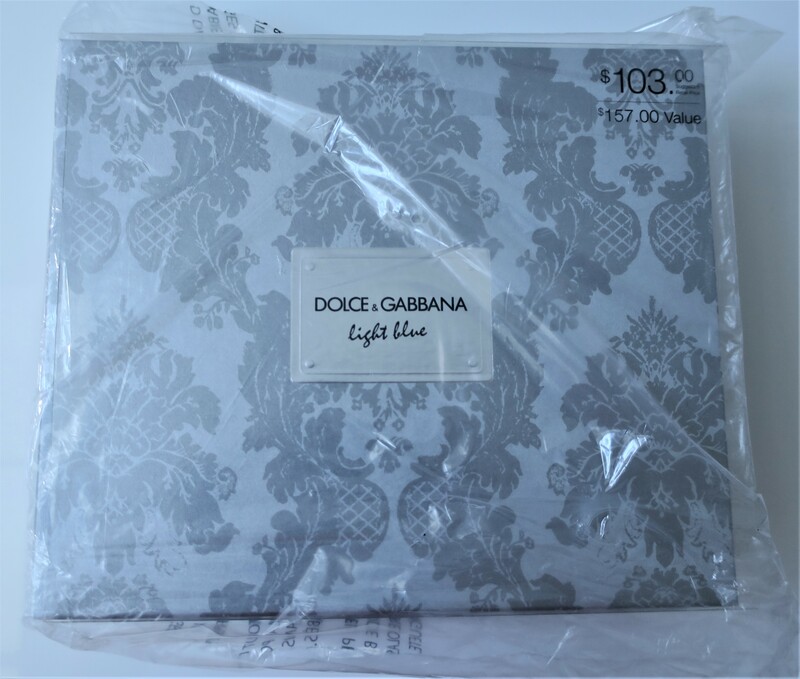 They had several Fragrance Gift Sets available for purchase, but I went with D&G Light Blue because it’s what I know and love! I tend to repurchase this gem of a fragrance every time I run out of it. It’s just that good! I’ve even reviewed it, several years back (here)! In a country like Kuwait, where we experience stifling heat for the majority of the year, Light Blue is light (just like the name says lol) and refreshing! In my eyes, Light Blue is the quintessential summertime fragrance! The Gift Box itself was actually stunning! More importantly, it didn’t stink (unlike the Gift Box that housed Reb’l Fleur lol)! I was as in love with this Gift Box as I was with the Eau de Toilette! I’m definitely, definitely gonna’ repurpose it for storage use! I could’ve just waited and purchased the Eau de Toilette locally for KD 37 (haulage here) or gotten all of the above (Eau de Toilette + Travel Spray + Body Cream) online for KD 33/700. Obviously, I went with the latter. 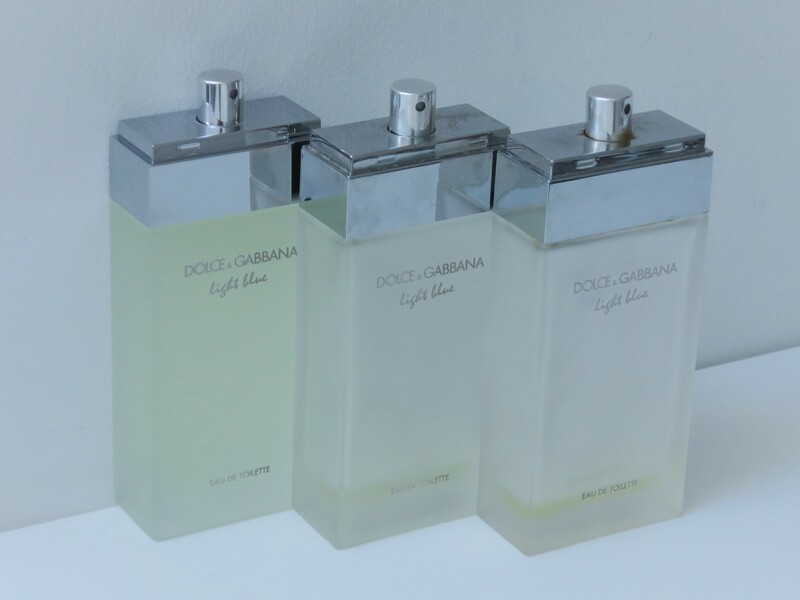 As I said, the scent is absolutely perfect for Kuwait’s unrelentingly hot weather! Also, the Refreshing Body Cream would make a preferable alternative to some of my more sweeter smelling and therefore slightly overwhelming moisturizers when it’s hot out. Plus, the Refreshing Body Cream would be excellent for layering! The Travel Spray would be ideal for tossing in my micro purses and other smaller handbags! As for the full size Eau de Toilette, I go through that stuff like water (as shown below). I’ve already completely used up my previous bottle of Light Blue (haulage here) so I needed to repurchase a new one anyway, but this Gift Set was too good to pass up! As you can see, Light Blue is a forever favorite! This particular scent (No. 9 – Blackberry & Vanilla Musk) had been on my Nordstrom wishlist for a minute now. Since it was a blind-buy, I didn’t wanna’ spring for the full size, only to find out that I didn’t actually like the scent. Since it was available for purchase in Pen Spray form, I picked it up in the smaller size instead. Plus, it helped bump up the total of my order so I could qualify for the Fragrance Sample Pack (haulage here)! Honestly, I just wanted this particular scent (No. 9) because it featured notes of Blackberry (meaning I was pretty sure I was going to love it)! I was not wrong. It smelled deliciously sweet and musky! It actually reminded me of Philosophy Unconditional Love (reviewed here)! In fact, it’s the closest dupe I’ve found so far! I’m super happy that I picked up this lil cutie! Special Mystery Bag featuring a beautyblender in a surprise color plus a mini blendercleanser Solid Swirl. Plus a chance at getting the limited-edition 2019 hue! I thought this was a really cute idea! I believe it was one of the many sets that Nordstrom were selling for the Holidays. I’d already qualified for the Fragrance Sample Pack so I didn’t need to purchase this thing, but I wanted to. Also, I love surprises! Basically, you got a BeautyBlender Sponge and a BeautyBlender Cleanser (mini). The surprise part is the fact that you didn’t know which color out of all 4 that you were getting. You got a chance at getting the Original (Pink) or Joy (Yellow) or Chill (Green) or Mystery (?). As you can see, I ended up with the Original (Pink), but I’m not mad at it. Pink is always cuh-yoot! Every order (even if it’s only a single item) qualifies for samples. In this pack, I ended up getting all of the above. I won’t go through all of them because… I don’t feel like it lol I will however go through the Fragrance Sample (on account of Perfumes being my new obsession and all). Wow! This thing smells ah-maze! Despite the floral-y bottle and the name Garden, which both led me to believe that this was yet another stuffy floral scent, I was delighted to find out otherwise! Dolce Garden smelled like sweet mangoes with a side of coconut water! It was deliciously sweet and fruity and undeniably tropical! I’m purchasing the full size of this baby for sure! 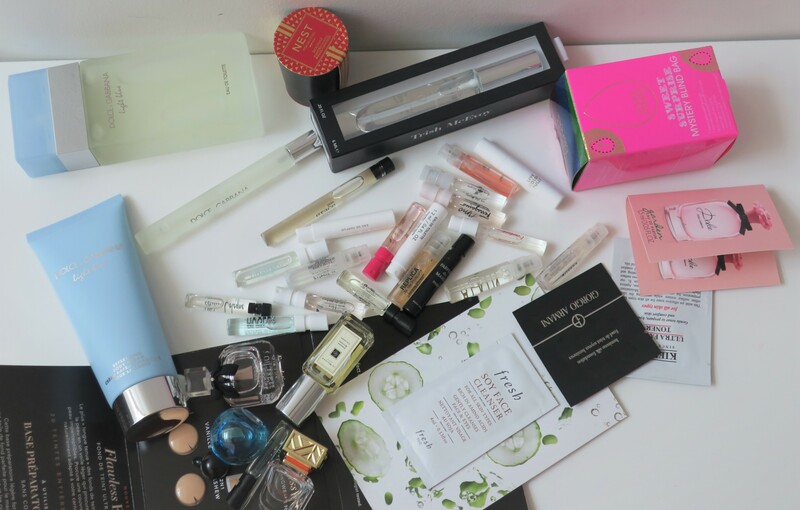 Lastly, here’s a photo of all the samples and fragrance samples and the stuff I actually bought, layed out together (so you can get a better idea of what everything looks like… or something). Yet another pleasant experience from Nordstrom! Now, compare this post to my Perfume Fail post (here). When shopping locally, I end up paying more and getting less, with a side of snark to boot! Plus, when purchasing locally, unless it’s at a legit store like Sephora, it’s not necessarily authentic nor new (without any way to confirm). Even when purchasing at Sephora though, getting proper assistance, or even just a single sample is practically like pulling teeth (case in point)!